Toddlerhood means your baby is no longer a cuddly, wriggling, pink mass of tiny limbs, toothless smiles and attempts at crawling. It means that they are growing into a unique personality with a motor mouth and even faster legs. This is the time when they are like warm, wet clay, which you can shape the way you want. It’s the time when your child grows the fastest and absorbs the most, so you better be up to speed with their growth. 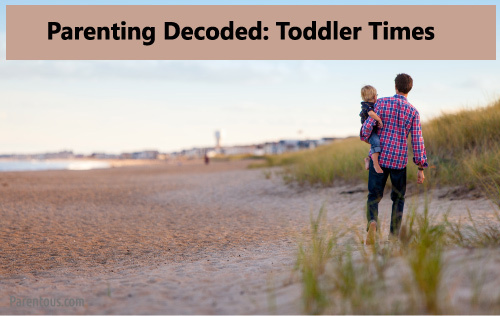 Parentous gives you a lowdown on ‘Toddler Times’ in this edition of Parenting Decoded. Heard about the Terrible Twos? Most parents have not just heard about this term, but experienced it firsthand. Sunita Rajwade writes her take about how all rules get flipped on their head when a baby hits the age of two. Watching your baby crawl, stand up and start walking gives parents an unmatched joy. And the worry of the child hurting himself on sharp corners or electric sockets comes hand in hand with this joy. Pooja Tyagi has been through this phase, and gives you ideas to toddler proof your home to make it a safe place for your little one’s adventures. When the baby hits the magic age of 6 months, parents start thinking about introducing them to solids. By the time they reach toddlerhood, kids eat more and more solids. This transition is not easy, and Sid Balachandran has some handy and useful tips to make this leap a happy one for both child and parent. Ga Ga Da da Mooo – We haven’t lost it (yet) This is just how first words from a baby sound like, right? Even the biggest grammar Nazis among us love the nonsensical babble when it comes from a baby. Same is the case with Sunita Rajwade, who has learnt the fine art of deciphering a baby’s first words. Toddlers must count among the most entertaining beings on the planet. They say and do the strangest things, which embarrass and amuse people around them no end. Sirisha Achanta lists down some of the things that her chatterbox says; a fun read indeed! Toddlers haven’t mastered language yet, but that doesn’t mean they can’t appreciate a good story, especially when they are feeling sleepy and want some fodder for their dreams. Reema gives you her list of 5 best bedtime story books. Kids are supposed to be protected from the outside world, and new moms are not supposed to have a life other than her baby. All this translates to lack of stimulation and variety for both baby and the parents. Sakshi Nanda feels that a toddler needs a healthy dose of these three M’s to be happy! Your toddler may squeal happily when you switch on the mixer, or try to run outside whenever a car engine fires. Adults don’t understand this preoccupation, but try to use them to amuse kids. Fabida Abdulla tells us ways in which you can channelize this obsession for their benefit. Toddlers have a very active imagination, and are at an age when their mind absorbs everything like a sponge. Every parent knows that this is the time to stimulate their child’s mind at this stage. The problem arises when he or she gets bored with all the toys and want more. Reema has a few games that are perfect to keep a toddler’s little fingers and mind occupied creatively. All parents want to give the best toys to their children. Most relatives also come with an armful of toys when they visit the kids. Toys have gone from simple things with a few moving parts to contraptions with remotes and motors and what not. Sunita Rajwade talks about these new age toys for toddlers and the value they add to a child’s life and imagination, if any. Normal people may shudder at the thought of discussing pee and poop, but it takes a parent to discuss the motions of their children with gay abandon. As soon as the child starts vocalizing and sitting upright, parents march on the mission to get rid of the diaper and successfully potty train their child. Sakshi Nanda talks all things poopy and gives you some valuable tips to earn your child the badge of a ‘Potty Trained Child’. Flaunt it proudly! As babies get the gift of the gab, they also get the uncanny ability to use it as a weapon. If they don’t get what they want, they scream, rant, hold their breath, lay down in the middle of the road and generally make parents wish they could disappear. Gauri and Rituparna take control of the situation and give you some solutions to take care of temper tantrums. Nowadays, we see babies being adept at and fascinated by technology. They start staring at screens at a few months old, and unlocking screens by the time they are one. Just because they are surrounded by technology doesn’t mean that they should be addicted to it, as Narayani writes. 14. Do You Live With A Toddler? ‘Parents Of A Toddler’ should be classified as a subspecies within the human race. They are easily identified by the harried but happy mood they are in constantly, and some other sure shot signs, which Gauri explains very scientifically. ‘How old is your child? Oh 13 months..has he started walking yet? My baby was running at 11 months of age!’ Raise your hand if you have heard such a line from fellow parents. Babies may be too young to understand competition, but their parents more than make up for it by pitting their babies against each other. Cynthia talks about her experience. The feeling of ‘Oh My God, I’m a PARENT’ hits you as soon as you hold your baby for the first time. With this feeling, come the doubts about doing the best for your baby, choosing the best from hundreds of options – everything from clothes, formula, diapers, creams and what nots. It’s only when the baby grows up a bit that you can learn to relax, like Aditi Mathur did. Parenting seems like pure logistical work sometimes, especially in the first few months of a baby’s life. As one day melts into another, parents sometimes tend to forget that these are the golden months of their life. Reema writes a letter to her two year old, pouring her heart out in the post.